Passenger restraints for sleeping quarters? 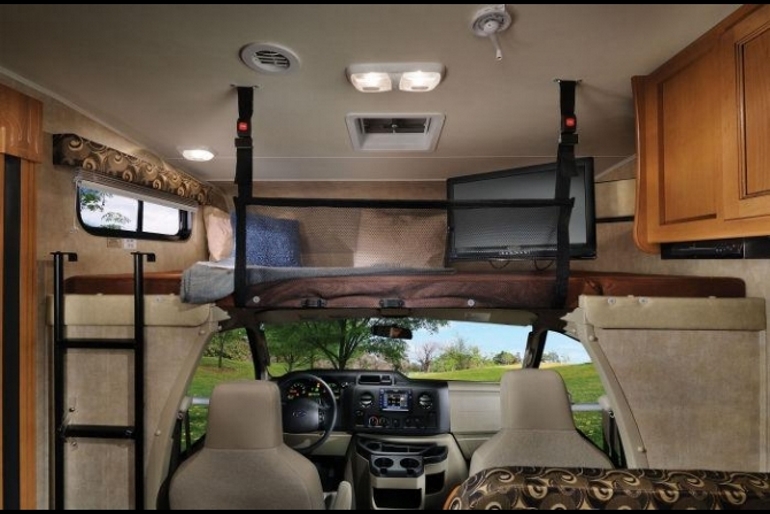 My van has a platform bed in the rear and I was trying to figure out if there is a passenger restraint system that I could use to allow kids to sleep back there while in transit on long trips. I know they have them for pets, do they have something for humans? I was thinking of some sort of hammock/net that would restrain them in case of a sudden stop. What layout do you have? We have a dinette and I just cut a piece of white 1/4" pressboard. It wedged perfectly between the cushions and the seat side frames and we just stashed it behind one of the back cushions when not using it. It worked out perfectly for our little dude and he got his daily dose of formaldahyde every time he chewed on it. If you look at the upper bunk in many newer class-C motorhome, they have a nice net system for a restraint, which uses seat-belt buckles at all 4 corners. All Forest River models have it. I think maybe Thor too. Not to be a bummer or downer or anything and definitely look at what carringb has suggested, but please do be careful when doing any kind of seat belt thingy. I am agonizing over this type of thing as I install my own belts and bench seats. Just a single waste strap can do more damage than good. I hate even thinking about something bad happening but I gotta keep the kiddo's safe. I am completely overdoing all my bolts and backers and hold downs. But yeah, I am gonna look into that too. Sometimes the only way to go is to cruise at night with the kids sleeping! when we rolled our van last month, the only person injured was my son, who was lying down on the 3rd row bench, with no belt on. when we flipped, it must have slammed him against the roof, as he ended up with a compression fracture in his spine. he will always wear a belt now. luckily he is on his way to full recovery, but he is also 17 and not as fragile as smaller ones. careful with those kiddos in the van, and make sure they are restrained properly. Thanks for that bet on black and again, I am sorry for all that went down with that and glad your son will recover. I was reading up on kid seats as my boys are going from small seats to larger ones. I could probably get away with a booster only but we opted for another bigger kid seat. What we read was that it's all about being restrained in a rollover. Worth reiterating for sure. I just passed two accidents coming home from work. I'm definitely interested in finding solutions to this. Gotta keep the family safe. My worry about the web above is that the holes are big enough that one strap could be behind someone's neck and the hole has enough room for the head to rotate a full 180 degrees and snap the neck. The holes need to be smaller so the head can't go through.